The study was funded by the National Science Foundation with support from the Marsden Fund Council in New Zealand. The breakthrough came from the comparison of carbon isotope ratios in pristine samples of ice mined from the Taylor Glacier in Antarctica. Although such isotopic fingerprinting strategies have been attempted before, the key was detailed work both in the field and in the laboratory that improved the precision to read the record in fine detail. The study found that during the initial rise in atmospheric CO2 -- from 17,600 years ago to 15,500 years ago -- the light isotope 12-C increased faster than the heavier isotopes, pointing to a release of carbon from the deep ocean. However, at about 16,300 years ago and 12,900 years ago, there were abrupt, century-scale perturbations in the carbon ratio that suggested rapid release of carbon from land sources such as plants and soils. Although the region of the CO2 source is not clear, the scientists say, at least one of the two events may come from the tropics because methane from tropical swamps rose at the same time. "One theory," Brooks said, "is that an influx of icebergs in the Northern Hemisphere at about 16,300 years ago -- from retreating ice sheets -- cooled the North Atlantic Ocean and pushed the tropical rain belt southward over Brazil, expanding the wetlands. Swamps in the Southern Hemisphere, in places like Brazil, may have become wetter and produced methane, while plants and soils in the Northern Hemisphere, in places like China, may have been hit by drought and produced CO2." During the next 4,000 years, the continued rise of atmospheric CO2 -- by about 40 parts per million -- was marked by small changes in the carbon-13 to carbon-12 ratio indicating additional sources of carbon from rising ocean temperatures. This CO2 source, analogous to the bubbles released from warming soda pop, may have added to the biological carbon sources. 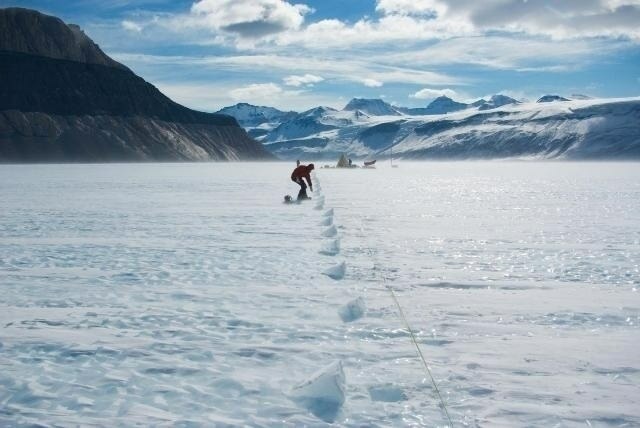 The application of this carbon isotope technique became possible because of a unique site along the margin of the Antarctic ice sheet where old ice that flowed from the interior is exposed at the surface of a large glacier -- Taylor Glacier -- named for a geologist on an early expedition to the frozen continent. Ice that normally would be a mile or more below the surface is available to easily sample in large quantities. These large samples, laboriously cut from the exposed ice layers, allowed the precise measurements, the Oregon State researchers report. "The isotope ratio technique gives us a sort of 'return address' for carbon dioxide," noted Thomas Bauska, a former Ph.D. student and post-doctoral researcher in OSU's College of Earth, Ocean, and Atmospheric Sciences, who was lead author on the PNAS study. "The technique is new, extremely precise and gives us one of the best windows into the Earth's past climate." Bauska is now a post-doctoral researcher at the University of Cambridge in England. That window into the past may provide hints at what may happen in the future under a new global warming regime, noted Alan Mix, an Oregon State oceanographer and co-author on the study. However, he cautioned, it isn't always simple to predict the future based on past events. "The rise of CO2 is a complicated beast, with different behaviors triggered at different times," Mix said. "Although the natural changes at the end of the ice age are not a direct analogy for the future, the rapid changes do provide a cautionary tale. Manmade warming from CO2 pollution may trigger further release from 'natural sources,' and this could exacerbate greenhouse gases and warming."